Here is a real turnaround story. The incumbent, City Councilwoman Lorie Zapf, is being cheered in Ocean Beach—the most liberal bastion in her district. At a recent Town Council meeting, she thanked the large audience for helping her fight to regulate short-term vacation rentals—a huge issue in OB. That was in reference to the 6-3 winning vote that Zapf and council colleague Barbara Bry garnered to regulate and restrict the neighborhood-destroying short-term rentals. In her nearby Pacific Beach and Mission Bay neighborhoods alone, there are 3,100 short-term vacation homes available for lease. Their response? More hearty applause. Zapf has found a new voice that resonates with her constituents. “I wasn’t elected to serve the interests of out-of-town investors; I was elected to serve the needs of my constituents,” she said. In so doing, she has moved from vulnerable incumbent to probable winner. Her once serious vulnerability stemmed from three things. Second, her neighborhoods feel under siege not just from short-term rentals, but from a loss of precious landmarks, their unique neighborhood character, and the pollution of the pristine environment they once knew. Third, the issues are gnarly, ranging from OB activists fighting a Starbucks store, a Mini-Target, the loss of their iconic Nati’s Restaurant, and the Rock Church congestion in Liberty Station. Add to these, the loss of once pedestrian-friendly beach boardwalks to electric scooters; the development of old school properties on Mission Boulevard, rutted streets, the Formosa slough open space fights, and various infill and expansion projects submitted by the Bahia Hotel and other developers. Then there are the mega developments planned for the old Post Office site in the Midway District and the Sports Arena acreage, the controversy over increasing density in Bay Park, and the DeAnza Cove decision. All are debates over development. 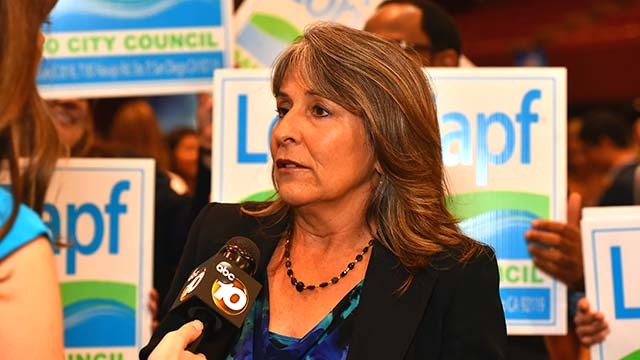 Zapf has addressed each of these concerns—preservation of old landmarks, cleanup of the bays and ocean, resistance to mega-developments, and paving her district’s streets faster than thought possible. Her latest win: saving the old Navy North Chapel built in 1942 after the bombing of Pearl Harbor, a historic landmark that Liberty Station development McMillan wants to replace with yet another restaurant. Zapf also secured a new fire station in Point Loma, and a $200,000 design/build commitment for a new Lifeguard Station in OB. In political parlance, she is bringing home the bacon. One thing Zapf also knows is that no one can get elected in District 2 who is not an avid environmentalist. As one who spent sabbatical year “backpacking around the world,” including hiking the Himalayas and scuba diving the Great Barrier Reef, she is now burnishing those credentials. She often leads clean-up events in her district and recently received the “Legislator of the Year Award” from the San Diego River Park Foundation. Her one costly misstep happened in one of the oldest, wealthiest and highest voter-turnout areas in her district—Pt. Loma. At issue was the planned three-story, nine-condominium development on La Playa’s Kellogg Beach. The opposition is fierce. The neighbors started petition drives, Facebook pages, held vigils, raised funds and crammed planning commission meetings. Their argument, is compelling: the loss of more precious beach with what amounts to the first beachfront high rise. Zaph stirred up a backlash with an original statement of support for the unpopular project, but has since reversed herself. Maybe just in time to secure her re-election.